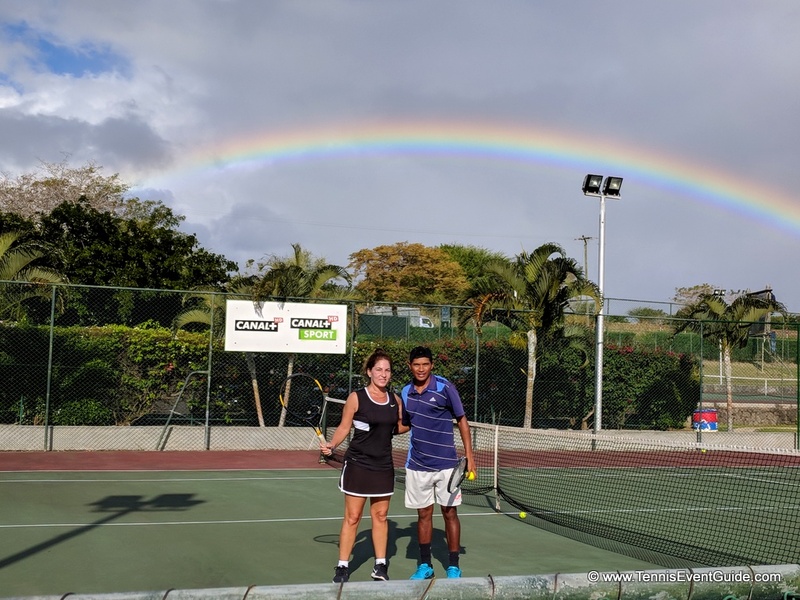 Tennis in Mauritius is easy to find no matter where you are the island. There are a ton of high end 5 star resorts like The St. Regis, Shanti Maurice Resort & Spa, Paradis Hotel & Golf Club and Sugar Beach Resort & La Pirogue Hotel. In addition, there are many smaller clubs on the island allowing you take a lesson or hit with a pro. I stayed in Tamarin, on the south east side of the island, at a lovely guest house, joined the Riverland Club for a month and got to hit with some great pros. The Riverland Club Tennis Tamarin offers tennis, gym, pool, bar, volleyball courts and much more. It’s an all around fitness and sports club very popular with the locals. I purchased a package of 10 lessons, which came out to about $20 each. Both my pros, Eddie and Jean Richard were excellent and gave me some great tips as well as putting me through some serious workouts. Luckily, there are rainbows just about every day over the tennis courts, making the experience quite surreal. If you’d like your tennis built in to your stay in Mauritius, then check out one of these hotels, all of which offer tennis programs. The St Regis Mauritius Resort – just a 2 minute walk from the beach, the St. Regis Mauritius Resort includes panoramic Indian Ocean and Le Morne Brabant Mountain views from its beachside location. Stylish accommodations, separate fitness and spa centers and 5 restaurants feature at this 5-star luxury resort. Shanti Maurice Resort & Spa – this resort is surrounded by coral reefs and dramatic mountains and the ocean-facing luxurious villas and suites are surrounded by exotic gardens and terraces. The spa, tennis courts and fitness center all get rave reviews online. Paradis Beachcomber – surrounded by beaches, palm trees and with a large pool, it also features 4 restaurants, an 18-hole championship golf course, a golf academy, tennis and volleyball. Sugar Beach A Sun Resort – located on Flic-en-Flac beach, this luxury hotel offers views of the Indian Ocean and features a spa and wellness center, tropical garden, large outdoor swimming pool, tennis courts and a fitness center.